미국을 중심으로 하는 다국적 기업들의 “글로발 자본(global capital)”이 국가간의 경계를 밀어내고 제3세계라 불려 왔던 저개발국들의 값싼 노동력들을 포섭하기 시작한 이래, 세계는 재빠르게 권력의 질서를 바꾸어 갔다. 마이클 하트와 안토니오 네그리의 연구성과인 “제국” 은 최근의 세계질서가 어떻게 편성되는지 명료하게 분석한다. (Micheal Hardt & Antonio Negri, Empier, 2001) 이들이 말하는 “제국”이라는 개념은 근대에서, 탈 근대로 이행하는 시기에 태어난 변종적인 서구 제국주의의 다른 모습이다. 근대의 제국주의가 영토를 나누어 식민화하는 것에 열을 올렸다면, “제국”은 영토의 경계를 지워가면서 팽창한다. “글로발 자본”은 이 제국의 논리와 함께 계속해서 탈 영토화 하면서 단숨에 소위 제3, 혹은 제4세계에 까지 잠입한다. “로칼(local)”간의 경계는 모호해지고, “지역성(locality)”이라는 이“차이”는 이 모호함 속에 차츰 그 벽을 무너뜨리는 것이다. 따라서, 이제 국가의 경계를 넘나드는 몸들이 등장한다. “글로발 자본”이 “지역”안으로 스며들어가 스스로를 확장시켜 나가는 동안, 이 “로칼”안에 가두어져 있던 몸들은 스스로 “글로발 자본”을 찾아 국가 경계를 횡단하기 시작했다. 민족국가(nation-state)의 보수 가부장들은 그들이 여성에게 채워 두었던 자물쇠마저 풀어내기 시작했다. 그들은 비로서 여성에게 “시민권”을 부여하고, 그녀들의 노동력을 요청한 것이다. 왜냐하면, “글로발 자본”이 강력하게 그녀들의 노동하는 몸을 필요로 하기 때문인데, 따라서, 제국, 혹은 자본의 품에서는 국가나 인종을 넘어 성별간의 경계까지 모두 와해되는 것처럼 보인다. 그러나 명백하게도, 이 과정에서 민족국가가 여성에게 부여한 “시민권”은 남성시민만을 보호하고 인정해 왔던 민족 국가가 자본의 재배치를 따라 그들의 이익을 챙기면서도 한편 민족주의를 강화하기 위한 전략일 것이다. 그리고 이러한 와해는 사실상 그 차이들을 인정하는 것이 아니라, 자본이 허용하는 범주 안에서만 용인되는 것이다. 도나 헤러웨이가 제시한 공장의 조립대 앞에 앉아 일하는 제3세계 여성들의 노동하는 몸의 위반적 가능성 (Dona Haraway, Cyborg Manifesto, 1984)은, 끊임없이 여성을 위협하는 민족주의 수사와 “로칼” 가부장제, 그리고 최종심급으로서의 자본 앞에서 힘을 잃는다. 하트와 네그리의 연구에서조차 가장자리로 밀려난 여성들의 노동하는 몸은, “전지구화”라는 세계질서의 재배치 속에서, 여전히 하층의 궤적을 따라갈 뿐이다. 여성의 몸은 생산업의 조립대 앞에만 배치되는 것이 아니라, 다른 “로칼”의 가내 노동력으로, 혹은 성 노동자로도 배치된다. 특히, 최근에, 한국의 기이한 결혼문화와, 그에 따른 결혼산업이라는, 다른 이름의 성 매매로 유입되는 이주 여성들이 급속하게 늘고 있다. 이들은 한국이라는 로컬 가부장제가 글로발 자본과 공모함으로써 이들에게 가하는 다중의 착취를 감수해야만 한다. 여성의 성과 노동력의 착취를 일삼는 민족국가와 세계적 자본의 구조는 “이주”와 “이산(diaspora)”이라는 이들의 경험에 큰 영향을 미치고, 그들에게 “조국”이나 “이산”의 공간은 모두, “욕망”인 동시에, 또한 “공포”가 된다. 따라서, "민족국가의 영토적 경계에 고착된 사유를 넘어 서자거나, 민족이라는 개념자체를 해체하자는 초민족/탈민족 담론이 논의되고 있지만 서구 제국에 맞서기 위한 거점으로서의 주변국가의 민족/국가의 개념을 고려하지 않을 수 없으므로, 제3세계의 페미니즘은 매우 복잡한 상황에 처한다." (태혜숙, 제3세계 여성들의 글쓰기, 여/성 이론 9호, 2003)이러한 상황에서, 제3세계라 불려져 왔던 아시아, 그러나 그 중에서도 제3세계의 새로운 중산층으로 떠오른 한국이라는 맥락을 염두에 둘 때, 소위 “전지구화의 시대” 라고 불리우는 지금, 한국의 여성주의 미술가는 무엇을 고민해야 하는가? 여성주의의 전략이, 끊임없이 경계를 지워내고 중심을 해체하며 규칙에 균열을 냄으로써, 고의적으로 누락된 소수의 역사를 복원하고 정치화 하는 것이라면, 여성주의 미술가인 나는, “조국”과 “이산”의 사이에서 상처투성이로 떠도는 이 여성들의 침묵에, 어떻게 접근할 것인가? 어떻게 이 “침묵”이 전복적인 말하기가 되도록 할 것인가? 이 “서술의 주체(agent of narration)”로서 그녀들은 그 침묵을 과연 어떻게 발화의 한 방법으로 사용할 수 있을 것인가? 그리고 나는 어떻게 그것을 “재현(represent)”하되 “대표(representative)”하지 않고(Gayatri Spivak, Can the subaltern speak?,1988)정치화 할 것인가? One day, unexpectedly I saw the labels on my clothing. I then would clarify globalised circumstance of the capital industry and try to check all my clothing out. In fact, the incompatibility of the information of the labels between the world-wide brand of clothing and the origin of product is quite disturbing to me all the time but I have never realised almost of my clothing in the wardrobe had same problem. It is directly signified the construction of current global capital industry. To someone, this embroidered letter of certain country in which capital is positioning in order to expand itself is simply signified working area somewhere, but, to me, that means, sometimes my home/land, sometimes my shame, sometimes my desire, and sometimes my disgust. Hope or lure, but inferior or incomplete. Since I came to England, I began to collect receipts as an evidence of my inevitable consumption for survival. The materiality of receipt gives me a meaning of “survival” or “desire for live,” and also this consumption is clearly signified the engage with globalisation. And then, I started to hand-sew with the receipts. Such action refers to my participation in the field of “living labour” and also the performance that I try to gather the moments of my experienced life in Western country. I then made a dress with that. This object designed to be able to associate white women’s wedding dress can reveal cheap gendered labour power and a surface of desiring women bodies. Sewing is traditionally recognised a women’s household work. Even in the working place outside domestic area, sewing work demand still female labour although it is machine work. Thus, even in industrial place, women are always forced to be required not only industrial capacity but also domestic. That is why doubled exploitation often occurs against women workers in the working place. The figure of women who is working with sewing machines in the factory is often crossed over the image of mothers or wives hand-sewing clothes for their family. It is obvious that the patriarchal discipline and rhetoric compel them to identify to the illusion of “ideal women,” every time, everywhere. My object of dress is therefore evolving such complicated woman subject anxiously locating every border. So, I hang the dress from the ceiling. It is a figure of their body that exist but be ignored, desire but be denied, survive but be evicted, and leave but float. In addition, I tried to install a digital projector with the dress, and will show a video piece which I contain the sewing performance, and leaving women, conceptualised my struggle. I try to dissolve two different places and performances. 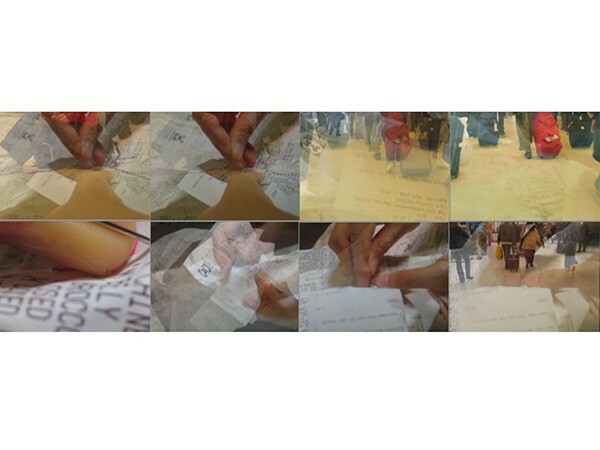 A hand sewing with red thread pierces into some receipts with body images leaving to elsewhere. I add echoing sounds on it, which is woman’s voice singing in Korean language. She is singing about her homlessness and hunger. Her unclear and weird voices are splited into two or four, and crossed over rhymes. This video is projected toward floor spreaded with rice. One of materials of this piece, rice, can be a metaphor of the economical action displaced from their surviving. It is also the main food in Asian culture, and it is only one that they can exchange with their labour in this capitalised world. To me, artwork is a confession of personal experience, a representation of struggle, and furthermore, a political statement. I desire to evolve women and their memory about nation and diaspora or in-between, and about their body labouring in the borderland, through the work. Thus, this work is with reference to women’s statement and my statement, a laboured (worked) statement, a laboured (hard) statement, and also a political statement. That is why I entitle “labour/ed statement” for this work.